We all know why dogs eat all sort of junk (even poop and vomit) and although it’s gross, we sort of know why they do it. Because they’re scavengers. But why are cats attracted to such materials that should have no taste appeal, like plastic. 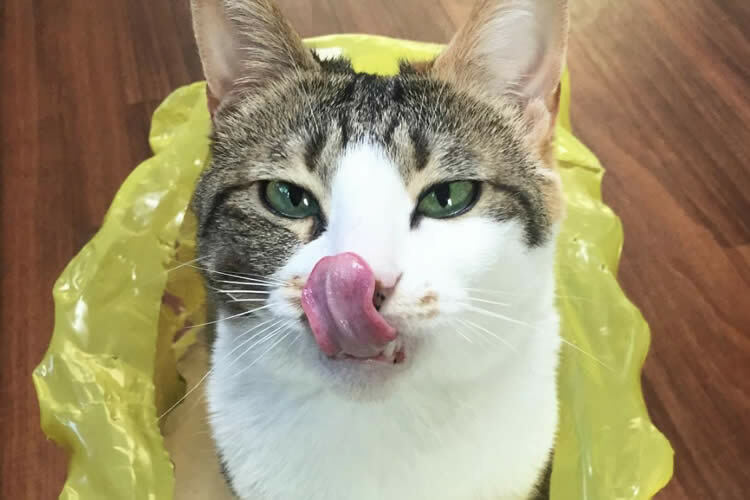 Why do cats love and lick plastic? Cats are most certainly carnivores and they know they are hunters. But let’s face it, cats have some strange habits. The plastic and plastic bag question is a puzzler to vets, pet owners, and scholars alike. The best we can do to answer the question is to compile some reasons as to why cats are attracted to plastic bowls, plastic bags, and plastics in general. Animal fat, fish oils, and fish scales are some of the ingredients you may find in the manufacturing process of plastic bags (fish oils and scales aid in keeping the plastic from sticking together). But even certain chemicals such as stearates (derived from tallow) can be attractive to cats. Cats will lick plastic and perhaps acquire some of that taste which corresponds to the odor. Fishy smell, fishy taste – yummy. But what about the other plastics that do not contain any of these ingredients? Perhaps the container once housed chicken or fish. Soft plastics are porous and can trap all types of odors that had once been contained within them, so you can bet there’s probably enough odor present to attract kitty! Would You Believe – Corn Starch? Biodegradable materials such as corn starch are now being used in the manufacturing of plastic shopping bags. For some reason some cats find the smell and taste of corn starch appealing. Cats are usually crazy in general – you never know what they’re going to do. Whether they knock over your potted plants just to hide in the empty pots or they simply lick plastic bags – their craziness never ends! The truth here is some mental health issues can make animals eat what they shouldn’t be eating. Mental health issues like Pica (the desire to eat non-nutritive substances) could be a factor. If the behavior is frequent it could be the result of an Obsessive Compulsive Disorder. These explanations are not to say that all kitty plastic lickers have mental health issues but if you notice this behavior during times of kitty high anxiety, you may want to consult your vet. Plastic bags can mimic noises made by scurrying creatures like mice. So can a lot of other materials but cats really do like the plastic noisemakers more than the others. A few chemicals may mimic pheromones and other attractants used in some plastics. Licking that plastic could cause the animal to facilitate the transfer of pheromones and other scents into the vomeronasal organ. This organ is located above the roof of the mouth via a duct which exits just behind the front teeth of the animal. These pheromones trigger the “Flehmen response” where the animal curls back it’s upper lips, inhales, then holds this position for several seconds. This could be the reason why some cats use plastic bags for a urinal. What really matters here is not why cats are attracted to licking plastic (which could add up to more reasons than we could list here). Rather, it’s knowing this action can be a problem only if the cat ingests plastic bags and if it’s a continuing occurrence. If so, this could be a health concern to be dealt with by you, kitty, and your vet.